I don't know about you guys, but at the moment my nails are in need of some serious TLC. Ever since I had gel nails, the condition of my nails has been pretty horrific. They're quite flakey, they break at the slightest bit of pressure and they're just not looking the best. In an attempt to get them back to their errr, previous glory(??!?) I ransacked Boots and once a week I follow this little routine in the hope of getting them stronger. Shape - I use a mini nail file to shape my nails. If they're all pretty similar in shape they just look visually better. I also keep a nail file in my bag in case of breakage. That way I can just file down the broken part of the nail. It's only now, writing this post, that I realise, that over the course of the Summer, I somehow broke my lifelong nail biting habit. Crazy. Before, if a nail broke, I'd bite it off (ewww I know) but these days I'm all about the nail file. I suppose the gels helped for one thing. Cuticles - I use this little cuticle stick from Essence to clean my nails and push back any excess skin around the nail area. A lot of people don't do this and you can be surprised at the difference it can make to your nail. Not only does it smooth out the top of your nail, but pushing back that excess skin can actually help make your nails look longer. Oil - because my nails have been so flakey and fragile, I've been applying this Apricot nail oil from Essie to my nail bed. I dab a little onto each nail and massage it in. Honestly, I don't know if it's been making much of a difference. I like to think it is, and I'm going to continue to use it and get back to you on it fully. It smells nice which is always a bonus. 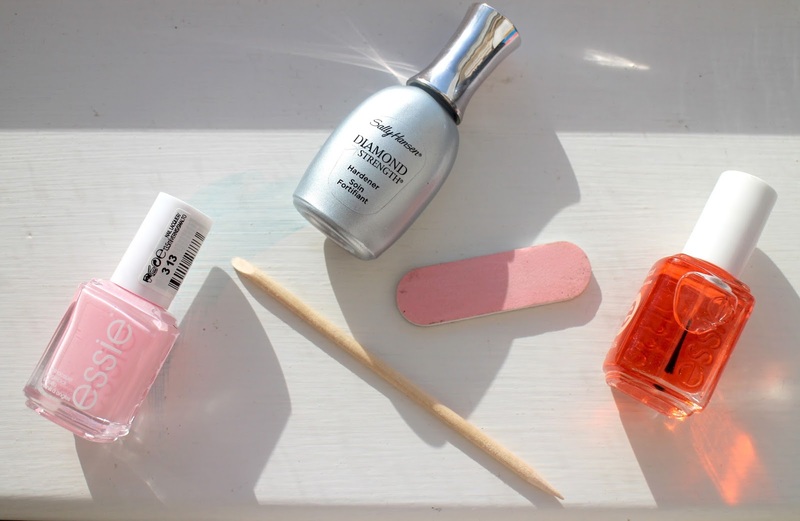 Nail hardener - my friend told me she used a nail hardener on her nails, and considering her nails are super long and healthy looking, her advice wasn't to be knocked. I picked up this Sally Hansen one in Boots for around 5€ and I've been applying it to my nails once a week. I use it as a base coat under my nail polish and I have to say, I really do think it makes a difference. Not only does my nails bend less when pressure is put on them, but they just look a lot less flimsy in general. I previously wanted to try the OPI version of this, but it's mad expensive and I just couldn't justify it. So if you're looking for a cheaper alternative, I'd highly recommend this Sally Hansen one. Top Coat - I'm a sucker for nail polish, but more importantly, I'm a sucker for Essie nail polish. At the moment I'm loving Essie 'Romper Room', but as we transition into A/W, I can't wait to start wearing my darker red and berry tones. I don't know if this routine really helps (all in my head? ), but I do know that since I've started following these little 'steps' my nails have been feeling and looking a lot better than they have in a long while. Nobody wants ratchet looking nails right? Do you guys do anything to help with the appearance of your nails? Comment below and let me know.